Wednesday’s ride took me down the hill to meet O. and R. for a much-needed work session, which mostly took the form of catching up, because we hadn’t seen each other in over a week. And then S. met us for a conversation about what it was like in the 1970s when she moved to Baltimore: being gay was considered “bourgeois decadence,” people lived in communes until they didn’t, and love was in the air. R. and I stayed late to have lunch and talk about what we thought we’d be doing when we turned 40, which she is doing in six weeks, and then I tried to wait out the rain before getting back on the bike. Waiting was futile, so I went ahead and got on the bike and headed down the hill and to the right toward Pennsylvania Avenue Star Spangled Heritage Trail for a walkabout–research for next week’s column for the Baltimore City Paper. (I’m a columnist now! With the local weekly! Woot!) I locked my bike to a No Parking sign on Pennsylvania and followed the signs leading me around a neighborhood I frankly wouldn’t be in, were it not for the historical tour. 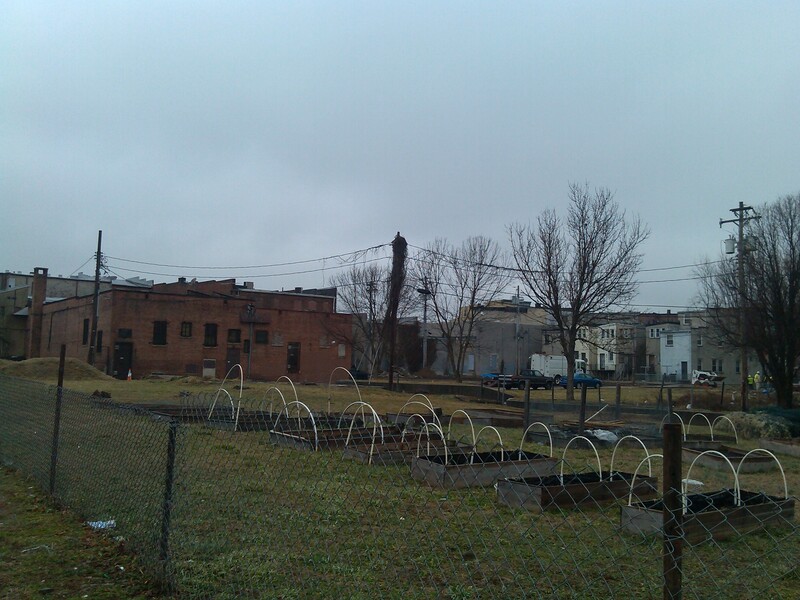 It’s not that I have anything against this part of Old West Baltimore, but the withdrawal of capital from the area means that there’s not a lot to do here–not much shopping or entertainment or coffee or things that would draw someone to this neighborhood if they didn’t live here. And I don’t, but it is clear that many do, and they’re ready for spring, just like I am, as these raised beds and hoops on Islamic Way suggest. People live full lives here, just as they do in my neighborhood and yours, even if this one is cut off from much of the city, no thanks to I83 and the rest of urban renewal. As I learned on my walking tour, Upton didn’t used to look like this; there was a time before The Wire, and it isn’t just The Wire now, either. And then I rode home in the rain, taking the long way around that the interstate demands. Yep, that neighborhood is cut off, and it is no accident. This entry was posted in bikes, blight, neighborhoods and tagged Baltimore, Pennsylvania Avenue, The Wire, Upton. Bookmark the permalink. Man, that croquet set-up looks way too easy.